Matthias Fronius. Statuta iurium municipalium Saxonum in Transyluania. [Transsylvaniae Corona : George Greus? ], 1583 / Der Sachssen inn Siebenbürgen : Statuta : oder eygen Landtrecht. Cronstadt in Siebenbürgen : George Greus, 1583. The Saxons began to colonize areas of Transylvania in the mid-to-late twelfth century when King Geysa II of Hungary (r. 1141-1162) and his successors invited German pioneers to settle, defend, and improve the less developed areas in Transylvania. In addition to land, these settlers were promised certain rights and privileges of autonomy. This promise was formalized in 1224 by Andrew II in Goldenen Freibrief. The Saxons sustained their customary law, much of which had originated prior to the colonization of Transylvania. 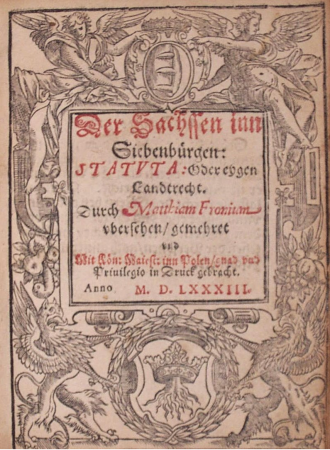 Der Sachssen in Siebenbürgen was the codification of these customary laws which, along with complementary Roman law, guaranteed Saxon Transylvanians personal freedom, rights to the land they settled, and equality before the law. The codification was approved by Stefan Báthory, Prince of Transylvania and King of Poland.